In a Nutshell: In most cases, a house with nearly 1,000 cats raises eyebrows. But The Cat House on the Kings takes pride in providing a lifetime home and outstanding care to hundreds upon hundreds of feline friends and other animals in residence. The Cat House also works to alleviate the animal overpopulation problem at its source through spaying and neutering services. For Californians looking to adopt, the Cat House’s low-cost process matches people with pets in need of loving homes; and even if you can’t make a long-term commitment to a pet, the Cat House offers opportunities to foster or volunteer. Most people don’t set out to adopt nearly 1,000 cats. The Cat House provides a safe, loving environment for animals that would otherwise lack a home. The 4,200-square-foot house sits on a 12-acre property alongside additional facilities dedicated to caring for all sorts of cats. “We’ve saved approximately 32,000 cats and 7,000 dogs, and we’ve spayed and neutered about 58,000 animals for the community,” said Beth Caffrey, Head of Donor Relations for the Cat House. For California readers thinking about taking in a four-legged companion, the Cat House is a cost-effective way to find a new furry friend and support a positive, proactive mission. The Cat House is an excellent alternative for people who want to avoid adopting from breeders, for either financial or ethical reasons. And, even if you can’t take in a pet of your own, it presents a great opportunity to volunteer and spend time with animals. Following her divorce, Lattanzio wanted to start a new life. She wanted to live somewhere quiet and on the water, so she bought a house and six acres of property on the Kings River in Parlier, California. This decision didn’t quite turn out as she expected. For the first few years, Lattanzio managed the cats on her own and funded their care with her own money. Eventually, Lattanzio moved into a mobile home on the property, giving the main house over entirely to the cats. Today, the house and property have been economized to meet the needs of its feline population. The Pink Room (named for the color of its floor) houses adult cats who are new to the sanctuary and were previously indoor-only pets. The Kitty Garden is an indoor solarium that helps this population acclimate to their new home, and the Condo Room is a transitional space that allows them access to the outdoors. Meanwhile, the Joan Droge Kitten Quarters are dedicated to providing a safe space for kittens to grow and develop, while the Sadie Malone Senior Center is part of a complex of buildings dedicated to meeting the special needs of aging cats. The Cat House grounds are also home to the Pasture Project, a 7,500 square-foot enclosure containing a Tuff Shed equipped with ceiling fans and heaters. This is where new cats stay for six months before being released to roam the rest of the property. Hundreds of cats just like this one are available for adoption at The Cat House on the Kings. The Cat House has also incorporated medical facilities to care for residents. These include a hospital (formerly Lattanzio’s bedroom), an ICU for seriously ill cats, and a short-term moderate quarantine wing. Also on site is a feline immunodeficiency virus (FIV) ward. Here, affected cats are separated from the rest of the population to safeguard their health and prevent possible further immune compromise from other animals. When a cat comes to this palatial estate, it’s presumably to stay. “We’re a no-cage, no-kill sanctuary where the cats can live out their lives,” Caffrey said. Any animal that comes to the house and isn’t adopted will be fed, sheltered, and given medical care for the rest of its life. Unfortunately, this kind of care is expensive and space is limited, so the Cat House can’t take in all the animals in need of homes — and there are plenty. To help address the problem of stray and feral animal populations, the Cat House proactively spays and neuters cats and other pets. Even people who aren’t pet owners benefit from the Cat House’s work. The fewer homeless animals that roam the streets, the less the public spends on animal control services. If you’re thinking about adopting a pet, then the Cat House wants to hear from you. “Pretty much everybody is up for adoption if we can find the right home for them,” Caffrey said. “We do over 1,000 adoptions a year.” Cats can be adopted directly through the Cat House or through its satellite adoption center located at Petco in Fresno. To begin the adoption process, aspiring pet owners will need to fill out an online form. 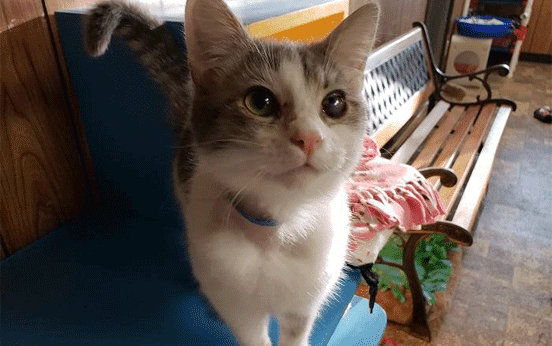 This can be either a general adoption or an application to adopt a specific animal, some of which can be viewed on the Cat House’s adoption page. If approved, adopters can set up an appointment to come to the Cat House. There, they’ll get to meet the cats in a special room set aside for potential pet parents to spend time with the adoptee-to-be, ensuring that each is a good match for the other. “We want to make sure this is going to be a lifetime of care provided for this cat or kitten,” Caffrey said. The Cat House charges $35 to adopt a cat that is six months or older and $65 to adopt a kitten. The adoption fees help cover the costs of spaying or neutering the adoptee, microchipping them, and administering the necessary vaccinations. This makes the Cat House an ideal option for anyone who wants to bypass breeders, rescue an animal in need, and get a new best friend for life. If you’re on the fence about adopting a pet, volunteering is a great way to solidify your decision, meet the cats, and support the Cat House. “We are completely donor-based. We receive no government funding whatsoever,” Caffrey said. Donations go toward maintaining the Cat House, caring for residents, paying the 40-odd staff members, and preparing mountains of cat food. 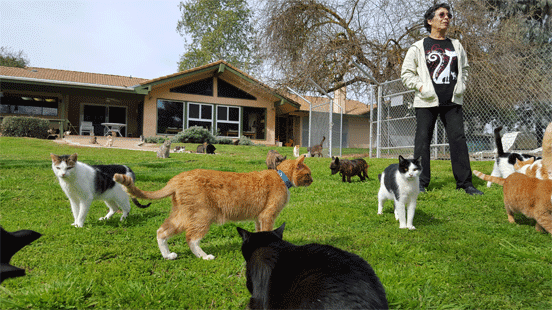 Luckily, the Cat House also draws plenty of animal lovers who donate their time and effort to the cause. So, even if you can’t make a commitment to a pet, volunteering at the Cat House and fostering animals in your own home are alternatives that let you spend quality time with animals. Like adopters, volunteers and fosters need to fill out an online application. On-site volunteers will then work with house staff to find the best-suited position and a workable schedule. The Cat House is open seven days a week, so there’s always ample opportunity and no shortage of work to be done. “We always need more volunteers,” Caffrey said. For people who work long hours or can’t support a pet on their own, volunteering provides an opportunity to spend time with cats without a permanent obligation. Other people pitch in for the sake of helping out a good cause. And, if you think you’re not a cat person, volunteer and give the residents a shot at changing your mind — there are plenty of good reasons to let them. The Centers for Disease Control and Prevention, Harvard Health, and other organizations all endorse pet ownership on the grounds of the emotional and physical benefits the experience provides humans. For example, research shows that looking into a dog’s eyes releases the chemical oxytocin into the brain, according to an article published in Science; and another article in Frontiers in Psychology argues that human-animal interactions generally promote the production of oxytocin. This chemical plays an important role in social bonding, and it creates a sense of emotional well-being. In short, caring for a pet makes people happier, and this happiness often leads to better mental health through reduced stress and anxiety. These reactions, in turn, can decrease blood pressure, cholesterol, and triglycerides, which subsequently reduce the risk of major ailments like heart attack, heart disease, and stroke. Playing with a pet can improve physical fitness, which also helps prevent major illness, and exercise releases endorphins, which also contribute to a sensation of happiness. Happiness is, ultimately, the Cat House’s goal. Whether you’re a cat or a human, The Cat House on the Kings will help you find the perfect companion so you can both live long, healthy, and happy lives together.